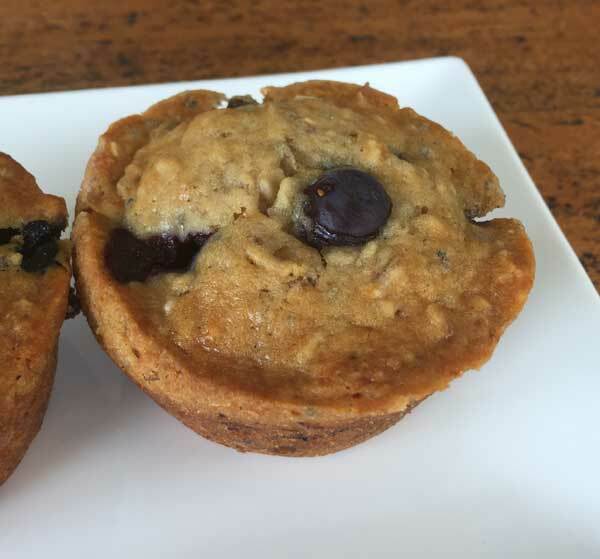 Vegan Blueberry Muffins are made with chia seeds, coconut oil and maple syrup. This recipe halves nicely if you only need 6 muffins. Preheat the oven to 375°F. Line a muffin tin with 12 with paper liners or just grease and flour a muffin tin. Combine the chia seeds and water in a small cup and set aside to thicken. Combine the almond milk and oats in a mixing bowl and let stand for about five minutes. Stir in the vanilla, brown sugar, coconut oil and maple syrup. Continue to let stand for another 5 minutes while you mix together the flour, baking powder, baking soda and salt. Add the flour mixture to the oat mixture and stir until blended, then carefully stir in 1 cup of blueberries. Divide batter evenly between muffin cups. Bake for 18-22 minutes or until edges are lightly browned and muffins appear set. Loosen the muffins from the tins and remove, then let cool some more before serving. These can be served while warm, but I think the texture is better after they’ve cooled. If you have some Weetabix you can substitute 4 Weetabix biscuits for the oats. The batter will be quite a bit thicker when made with Weetabix.